Thank you so much for your incredibly generous participation of our Year-End Campaign. Your participation has been so important and has helped us enormously. In this project report, I would like to describe to you one of our programs which you have supported. 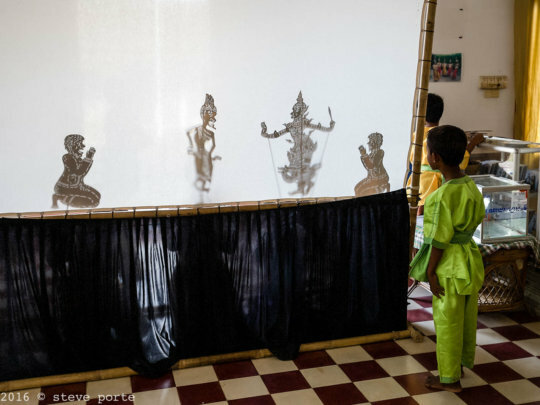 The Yike is an ancient art form, which originates from a fusion of the Khmer and the Chhampa Empires, dating back to around the fourteenth century. Today the descendants of the Kingdom of Champa are known as the Chham and probably were related to Malay people. Their religion is Islam and they are now a minority in Buddhist Cambodia. Around nine hundred years ago, through the centre of what is now modern-day Cambodia there was the Kingdom of Chhampa. The Khmer kings of Angkor were often at war with the Kings of the Chham, but their close proximity meant an inevitable cultural exchange. Later the Kingdom of Chhampa was assimilated into Cambodia. The epic battles between the two kingdoms can be seen on the famous carvings and bas-reliefs of the temples of Angkor Wat. The art of Yike is very similar to the Chham people's music and dance, but Yike in it's original pure form is practiced by very few Cambodians and is an art which is in danger of dying out. The Yike combines, music using the large Yike drum, song, dance and theatre. 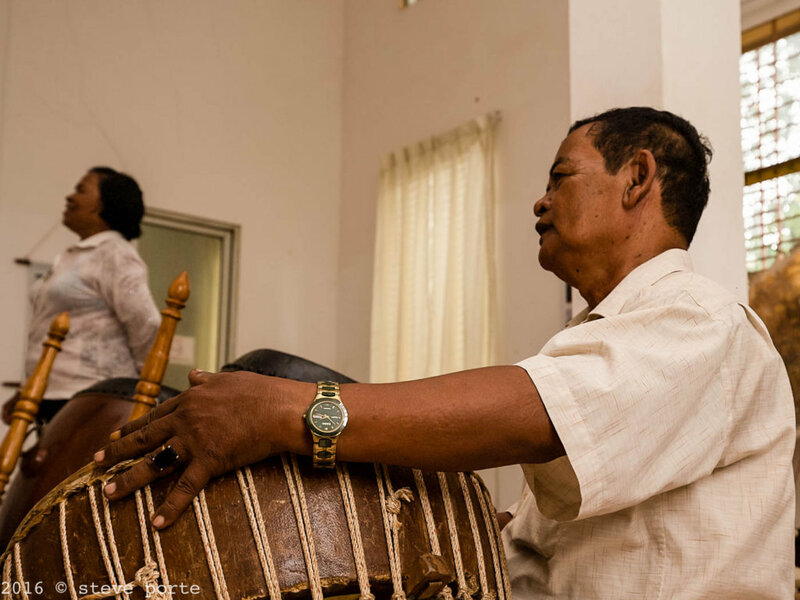 Many of the songs are ancient poems with words long-forgotten in Cambodia. Our school has the honour to have in residence for the last seventeen years, two of the last greatest Yike masters in Cambodia who are regarded as national treasures. Master Loak Kru Bèm and his wife Master Neark Kru Savorn* are from Chhouk District and their Yike troupe is famous. Both of them survived the Khmer Rouge genocide and the war, because they were told to take care of the Khmer Rouge fisheries in high lakes far from the oppressive mass labour camps where the majority of Cambodians were rigidly controlled and executed. However they faced a lot of danger when the Khmer Rouge regime collapsed and Khmer Rouge leaders retreated to their mountain bases in Kampot. The district of Chhouk and neighbouring Chumkiri came under constant fire, guerilla warfare and attacks on the civilian population. The Khmer Rouge factions were in competition with one another and one faction decided to execute Loak Kru Bèm for being a Yike musician. In great fear, he decided to go and see the most powerful Khmer Rouge leader of the area, who dominated both factions, to ask for clemency. The leader in question hearing Loak Kru Bèm play, said that he could not see anything wrong with the music and that Loak Kru Bèm, his wife and family should be left in peace. 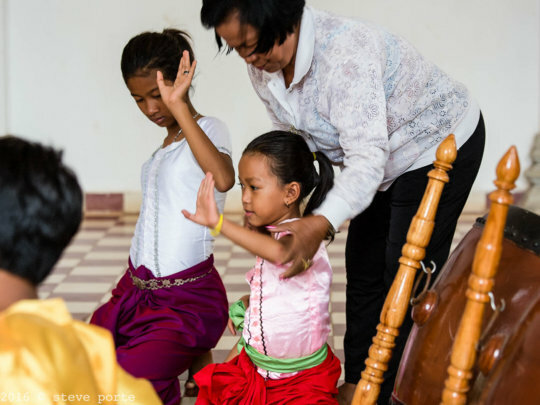 Not only do Loak Kru Bèm and Neark Kru Savorn teach Yike at our school for both our residential children and impoverished children from local villages, they are also devoted carers and counsellers to our children. Loak Kru Bèm takes great care of our large garden and both give so much more than is normally required of a teacher. They truly love our children and have profound concern for their welfare. 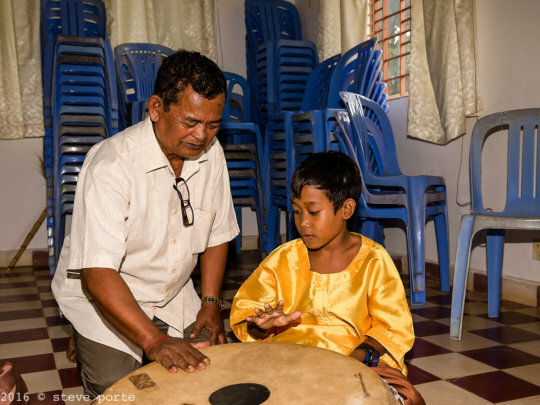 They are sensitive and kind to our little blind and deaf boy, who loves playing the drums because he can feel the vibrations and they encourage him to experiment with the instruments and even to dance. Both masters have prepared special performances with our students and we have together won two national prizes in the capital Phnom Penh and recorded a CD. You can watch them on our short film posted on our project page. You will understand what special people they are and how honoured and grateful we are to have them at our school. 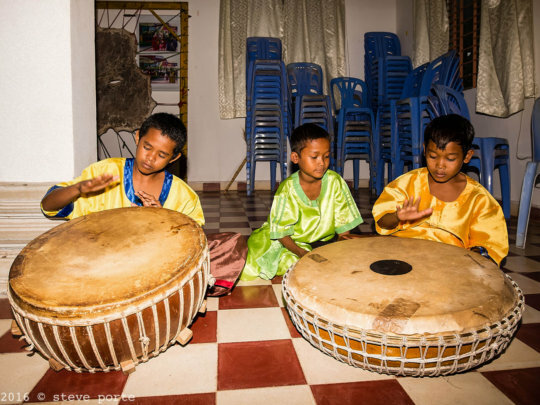 Because of your wonderful and generous help, we are able to support the Yike program and the great benefits it brings both to our children and to keeping alive the ancient, cultural heritage of Cambodia. * Loak Kru means Master (male) Neark Kru means Master (female). We have not given their full names to protect their privacy. Beyond our program to help orphaned children, (some affected with HIV and epilepsy) and our blind children, we also help very poor children and youth from local villages on the outskirts of Kampot. Many of our village children come from very difficult circumstances, not only because they are poor and some of their parents have gone to Thailand to earn a living, but because many have family-members who are addicted to alcohol and to gambling. Many of Kampot's youth within the town are addicted to drugs and to glue-sniffing, because this is a society which has broken down after one of the 20th century's worst genocides. The Khmer Rouge led by Pol Pot from 1975 - 79 forced the entire population into the countryside, creating vast concentration camps. There were no hospitals, medicine, clean drinking water, mosquito nets, nor sufficient food. Thousands perished from disease and starvation and thousands more were tortured and put to death, until a pre-war population of 6.8 million lost nearly a third of the populace. Adults suffering from Post-traumatic stress have never had relief and the Cambodian government has never really bothered to promote the truth or create reconciliation, because some of their top members are former Khmer Rouge. Why should the arts, especially music be of importance when children are poor or after a genocide? Because music and the arts can express that which words cannot. When a person has difficulty expressing their grief, frustration or anger they can speak through music or dance. When a child is faced with poor role-models and a crumbling society, then coming to learn music and art to a very high level is like a beacon of hope and light for them. Music and art can actually lift depression and anxiety and is good for mental health as well as emotional well-being. The children and youth from local villages come when it's raining or when the weather is fine and they study really hard, they want to be artists and they want to be professionals. Already the older, teenagers help our Pin Peat master perform for religious occasions in the Pagoda and have begun earning money and the older Mohori students can assist their master to perform at weddings. When we do our Traditional Shadow Puppet performances, they assist us with our Pin Peat music. Recently we hosted the Official Ceremony of the International Kampot Writers and Readers Festival and our students came to help our resident students in the important performances we had to give. Finally, because Cambodia's ancient cultural heritage was so badly destroyed, teaching it to the next generation helps preserve it. Modernization is good, but keeping one's cultural identity is good too. Whilst taking the British Ambassador around our school, unfortunately our oldest and most tattered of our dogs had decided at that moment to get onto one of our children's beds! Our lovely white walls were covered with little hand-prints and the monsoon rain had left everything sodden. There revealed was the other part of our school, our living, breathing and very real part. The part that people don't think of, but yet is the heart of our school. The challenges facing our staff are incredibly complex. We have our blind children and our little blind and deaf boy, who have very specific needs to be met, such as a needing a Braille teacher, Braille materials and a different kind of physical care than our sighted children, as well as special vocational training. Yet we also have children who are orphaned, some who have serious illnesses such as level 3 HIV, epilepsy and even brain-damage. Those who have been orphaned have gone through incredibly traumatic and painful experiences at a very young age. We have two sisters at our school whose mother died and whose father abandoned them to go and live in Battambang Province in the North-West, (Kampot is in the South-West). The younger sister Sokha was recently diagnosed with severe epliepsy and we must take her for treatment every month to the Kunthea Bopha hospital in Phnom Penh. Her older sister Vy* has important health problems too. She was kicked in the head by a cow when she was around six and was in a coma in the rural hospital. She never received expert treatment, but being a very resiliant girl, she survived. When she was around eight or nine years old, her father came from Battambang and took her away from her aunt while she was out and sold her to a wealthy couple for 300,000 Riel (Less than $100). For four years Vy was their servant and was beaten and stoned by the woman of the couple and forced to work around the clock. Her aunt who was very poor, borrowed money and "bought" her niece back again. There was no peace for Vy though, because her aunt's sister became mentally ill and began coming to their aunt's house and attacking her aunt and Vy. Sokha and Vy were too poor to go to school and being several kilometers from the sea, there was only salt water in the well for washing and not enough to eat. The two sisters became ill with malnutrition and lice-related illnesses, until finally the authorities and their aunt asked our school to assist them. Vy has blackouts and also understandably, periods where she has difficulty speaking about what happened to her when she was sold. Now she too must go and have a scan on her brain like her sister Sokha, to understand the extent of the brain damage she suffered as a little girl and whether she can be helped. In August we received into our care six children, five of whom are brothers and sisters. Their orphanage had closed down and the authorities helped place the children at our school. It began to emerge that in their old orphanage they had not had enough to eat, in fact two of the girls aged fourteen and fifteen had not begun their menses and only began after two months at our school. Orphans who had become adults still lived at the orphanage and beat the younger children, in fact we learned that our little blind and deaf boy who had stayed there, was beaten every day. The housemother not having enough to feed the children scavenged for scrap metal and was away most of the time. A climate of fear and a complete lack of adult care and guidance, resulted in the children becoming wild. Yet they are all lovely warm-hearted children, who were never educated or cared for before. Now we have the delicate task of helping them piece their young lives back together. Their baby brother who has moments of grief and stress shuts himself in the bathroom and screams and bangs the door, but he needs so much love and gentle firmness. Some of the younger children don't know how to use the toliets and so relieve themselves in the bathroom, other children use inappropriate language, because they were not taught anything else. There has been great improvement in a short space of time since coming to be with us, but perhaps most important of all is that they no longer have that scared, lost look, they have put on weight, regained their health and play and laugh as they need. Because the children who live in our school are so vulnerable and they just do not have anywhere else to go. 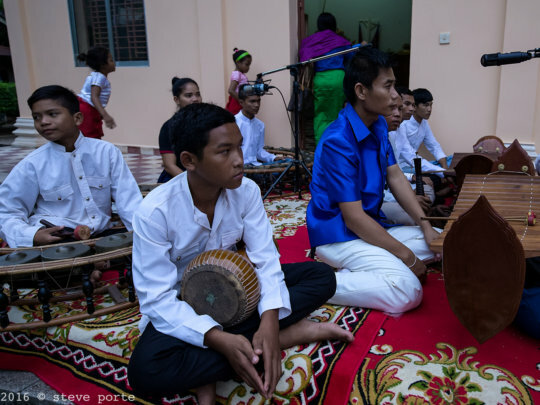 They deserve peace, stability, love, kindness, a good education, wholesome food, good living conditions and access to the arts firstly as therapy, after all their hurts and trauma and secondly as part of their cultural heritage as young Cambodians. Please help us so that we can take care of them. With your help we will feed them, clothe, provide medical care for them, give them transport to hospital in Phnom Penh, as well as scholastic school materials and traditional, Cambodian performing arts education, as well as other forms of vocational training. We aim to raise $7,000 or more. This season there is really the chance to make a difference, by supporting our children at our school. Please join our Year-End Campaign starting on #Giving Tuesday on 29th November 2016 from 00:00:01 EST to 31st December 2016 at 23:23.59 EST. Why is it so special? Because on #Giving Tuesday Melinda and Bill Gates are giving 1 million in matching funds and any donations made will be matched 50% by them......but you have to hurry, as it's best to give in the small hours of the morning (EST time) on the 29th to make sure matching funds don't run out. For this campaign you will need to donate using Credit card or Paypal only. Any funds donated on #Giving Tuesday will be counted at the end of the Year-End Campaign. #Giving Tuesday and The Year End Campaign are really important for our school as we raise significant funds to keep our school open and running. We need to raise more than 30 different, unique donors and more than $3,000 to be eligible to win a prize from Global Giving. Global Giving will be giving $10,000 in prizes to those organisations who raise the most and have the most donors! Donations can be made using Credit card, Paypal, Apple pay, cheque or transfer. As you might know, our organisation is Cambodian and we have no expatriate overheads and our board of directors is entirely voluntary, so that means all donations go directly to our programs and our children. Thank you for all the fantastic support you have given. Some of you have supported us throughout the year whilst others donated to our Year-End Campaign last year and the year before too! We are incredibly grateful for your generosity and vital support. * We have not given our children's full name in order to protect their privacy.